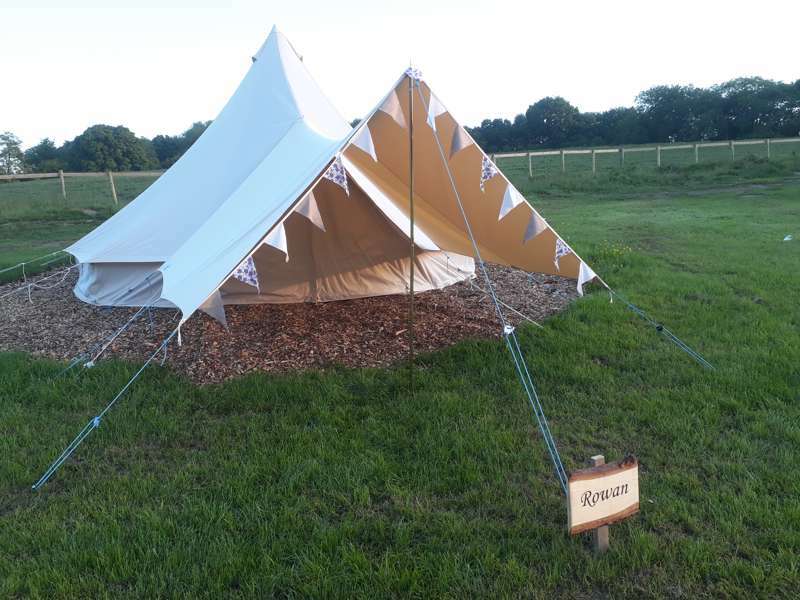 Book one of our 10 metre- squared grass pitches in our camping field, giving you fantastic panoramic views of the surrounding countryside. 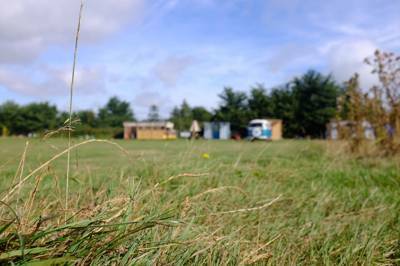 Book one of our 10 metre- squared grass pitches in our camping field, giving you fantastic panoramic views of the surrounding countryside. There is ample space for one car and a good sized family tent. Basic amenities are provided, which are water points, toilets and hot showers. Our site is 5 miles from the New Forest National Park, perfect for country pursuits such as fly/carp fishing, cycling and horse riding. 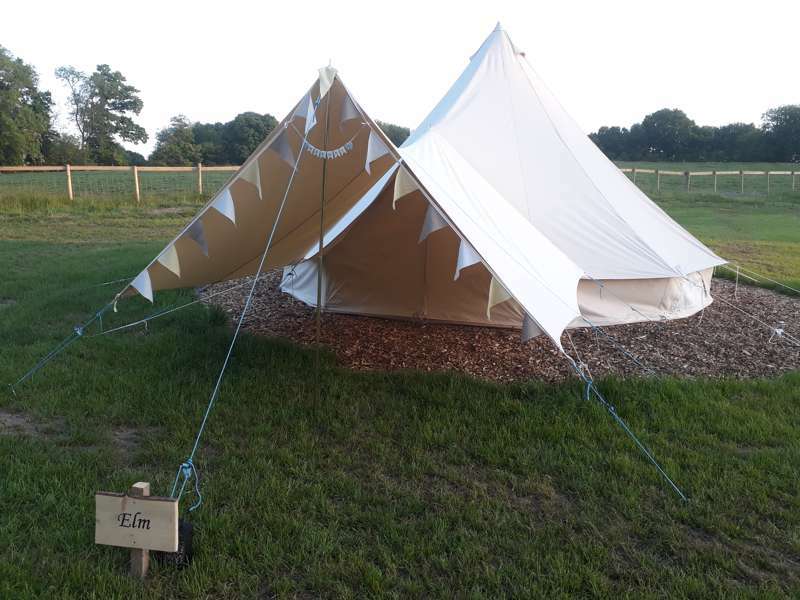 Our 5m comfortable bell tent, all equipped with a real double bed with mattress and bedding, with also the option of up to 4 inflatable single mattresses, also with bedding provided. 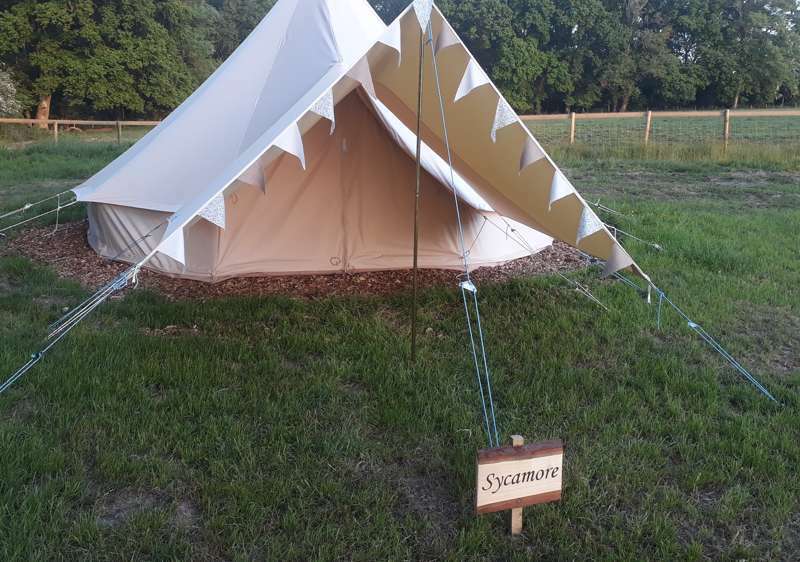 Each tent is carefully furnished with carpets for the ultimate 'home-from-home' comfort. 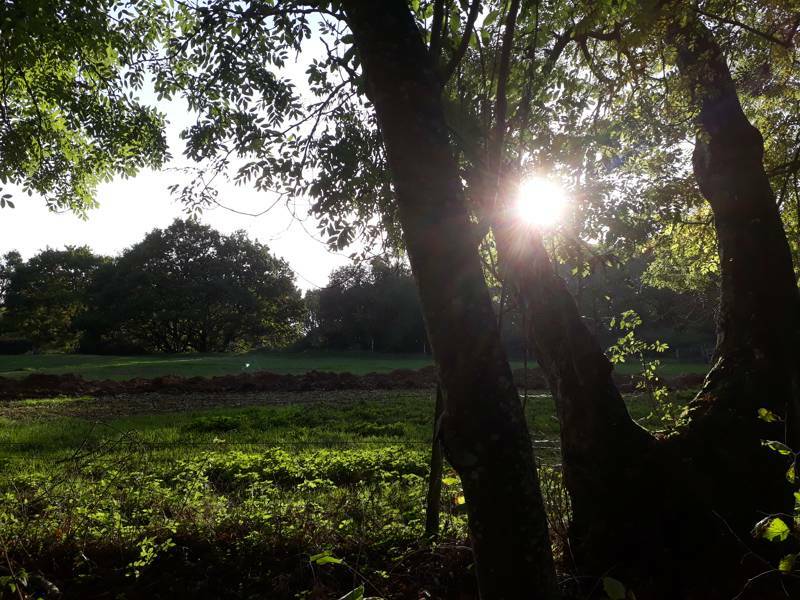 An exclusive hire area of our ancient woodland, cleared amongst the oak and beech trees for your own secluded area of wild camping. Area is available for hire as a whole, and can fit approximately 8 average tents in (depending on their size). In the centre is your own large firepit, the perfect focal point for any camping group. 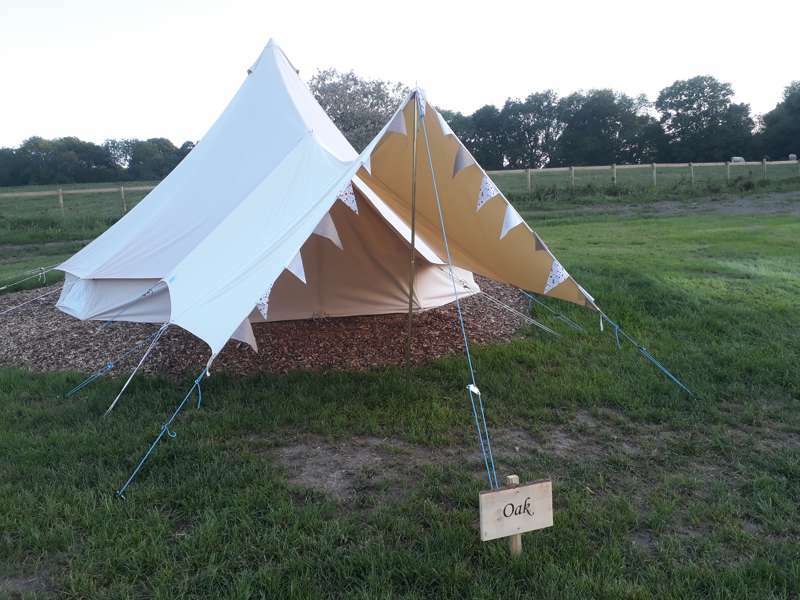 Simple tent camping in the farming village of Damerham with countryside views and easy access to England’s favourite natural playground, the New Forest. 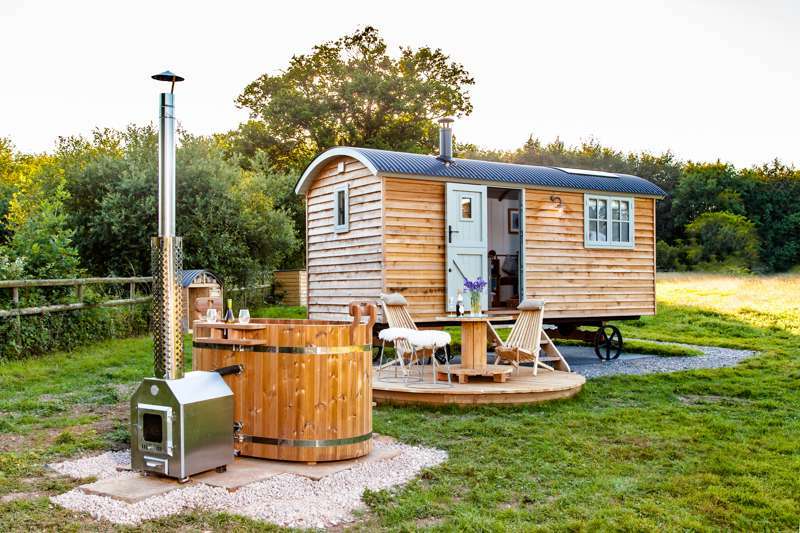 Despite being a new site, Jubilee Camping – located a mere 10 minutes from the New Forest National Park – has taken old-fashioned, traditional camping principles to heart and applied them to perfection. The site's owners, Alison and Dave, understand that campers want to let their kids roam around making dens and getting muddy. They understand the importance of a crackling campfire. And they understand that today’s campers don’t want to share these moments with big motorhome monsters and rows of caravans. It’s no surprise then, that we think this killer combination of space, campfires, and a tents-only rule, makes Jubilee prime camping territory. 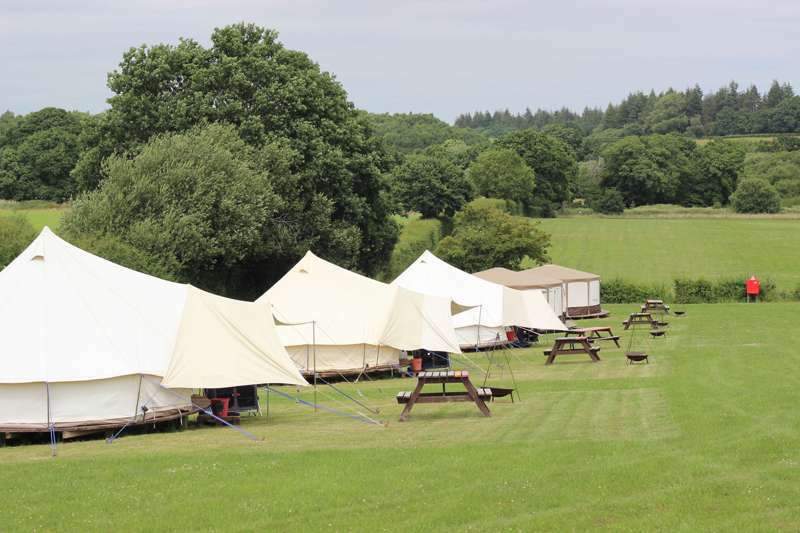 Consisting of little more than a four-acre field, the camping area – with 60 generously sized, 10 metre-squared pitches – is firstly, fantastically spacious. Due to its impressive size, the flat field never feels overloaded and there's always plenty of space for family fun and ball games. 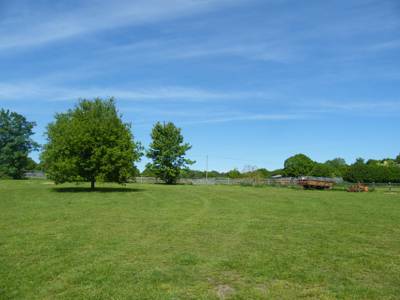 Surrounded by trees and with countryside views, there's a gravel track along one side of the field for easy access and a fence along the other, with livestock nuzzling along its base as they graze the longer grass that grows there. In fact, the land was previously a Hampshire dairy farm but is now occupied by a mixture of beef cattle and recreational horses. Washing facilities – housed in bespoke wooden-clad units built on skids – are impeccably clean and simple, but that's all part of the charm of Jubilee; a real throwback to the halcyon days of old-school, unfussy camping. 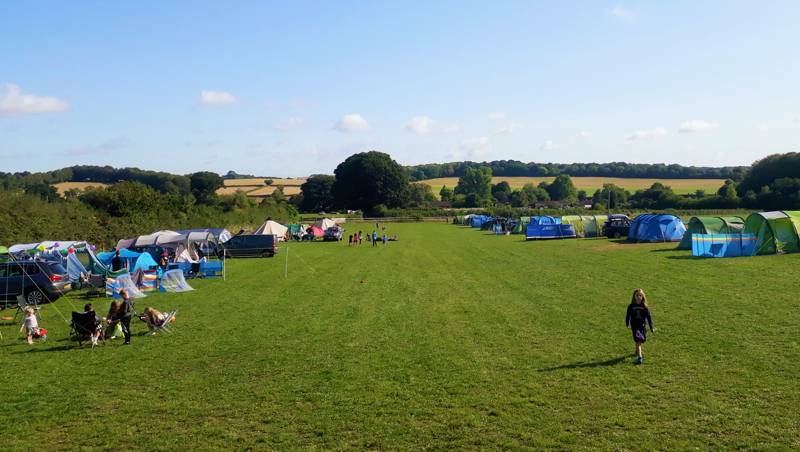 Simple extras include washing up sinks and a well-pressured water supply to the camping field, but there's no electricity and mobile signal is limited – although it can normally be found somewhere in the field. 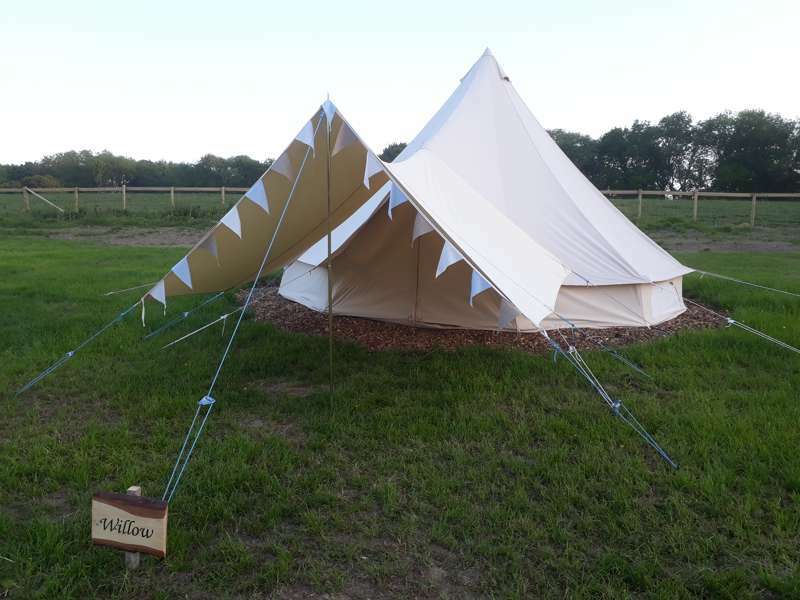 Jubilee Camping offers an 80-pitch campsite, Glamping area with 7 bell tents and wild woodland camping area for exclusive hire for up to 8 tents (depending on size) with own focal firepit. It's located on the edge of the New Forest in the farming village of Damerham, with easy access to beautiful country walks, historic visitor attractions, fine dining and family days out. For latest availability and best prices for Jubilee Camping, please use the Date Search above. 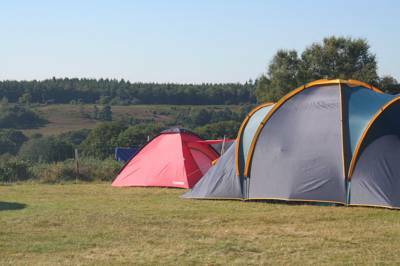 We had a super time - Aug bank holiday weekend, a spacious and friendly campsite within easy reach of the New Forest National Park. Easy walk to a good local pub (but would advise booking if going for food), our kids loved the Water Park at Fordingbridge too. Brand new showers and toilets, regularly serviced. Plenty of space for kids to play at the campsite too. We were looking for a last minute trip. We were lucky to find this wonderful sight. Dave and Ali are amazing hosts. They make you feel welcome and are there if anything is needed. Ruben, amber and psycho dog also made our dog very welcome. Our first night it was just us in the field, which is an unusual stroke of luck and we definitely made he most of it. There’s a few different fields to choose from. There was fire pits to hire and kindling and firewood available, Saturday night Dave and Ali sorted a pizza night, they thought of everything to make it a fun stay. Can’t recommend highly enough. It’s a very child and dog friendly site. Lots of space and the tractor inner tubes made for great fun with the kids. Can’t wait for next year to be able to go again. Thank you again Dave and Ali. See you soon. Mellisa, Lyndsay, the boy and rafiki. A lovely campsite with clean toilets and showers. 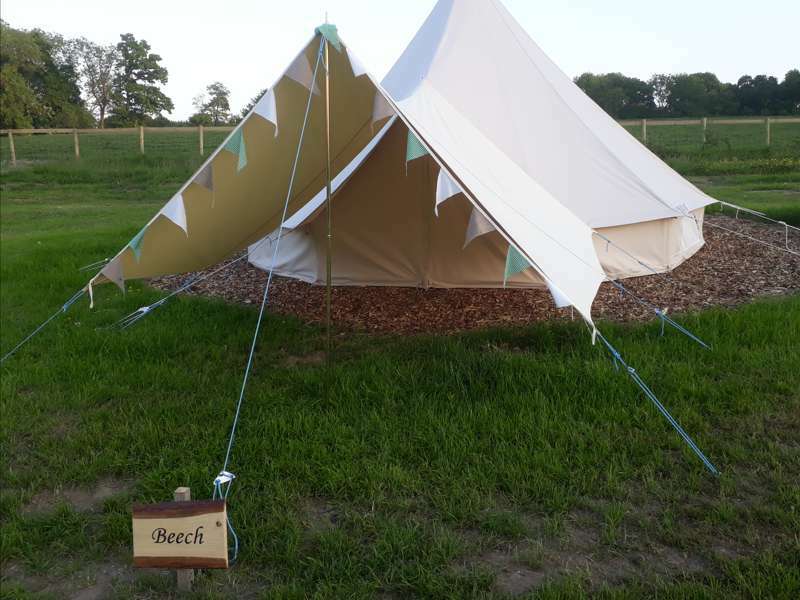 Bell tents were clean and beautifully presented. I loved the fact that it was just a field with open spaces for the kids to run around in - no clubhouse or arcades! They were never bored and amused themselves for hours on the tractor tyre inner-tubes! The owners were there each day to check we were ok. We loved the fact that we could take the dog and she could be off- lead and sleep in our bell tent. This made life a lot easier for us. Overall a great few days. Our first time proper camping and it was everything we hoped for even with the weather not being that great. Alison and Dave were very hospitable and the extra touch of the ice cream van coming round the tents was brilliant. Very clean campsite, great bathroom facilities and a lovely location. Could not have asked for more and wish we had been able to spend an extra night. Thank you. We loved our 3 nights at Jubilee Camping . The perfect location for kids and a dog. Lots of space, for running around and playing games and a 10 minute walk down a quiet country lane to a great pub! The hosts were friendly and relaxed and the hot water was limitless. We will definitely come again! We stayed here for a week in order to explore the New Forest and had the site to ourselves for one might; apart from that it was fairly quiet so we had plenty of space, but it is well spread out even when busy. The owners were friendly and accessible (coming on site promptly one morning when the hot water wasn't working). The shower and toilet facilities are of high quality, with plenty of hot water for showering and washing up. All in all an excellent site. As noted in another review, the only issue we raised with the owners before leaving was that it would be useful to have some facility for freezing cool blocks, which they said they will give some thought to. Absolutely loved this campsite. Spacious, peaceful, good facilities, friendly owners and views in abundance. The New Forest is only a short drive away and the Compasses pub is worth the a visit for tasty food and a pint. The kids loved it, will definitely come back – I'm sure word will spread about how lovely this campsite is. We hit the jackpot with this site as the scenery is beautiful and the camping spacious. I would highly recommend a visit here, as its a hidden treasure. 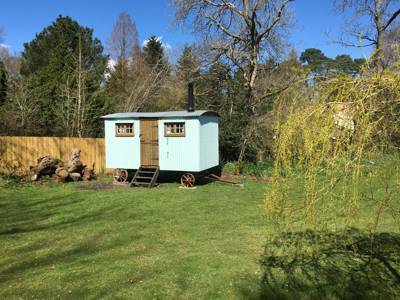 The hosts are incredibly friendly and welcome a true camping experience of log fires (fire wood provided), dogs allowed to stay on site and the kids encouraged to play in the open surroundings. The shower and toilet facilities are tasteful and well kept. Also the hosts are on site frequently to check everyone has what they needed, selling BBQ coals, etc. There is a lovely pub just a 10 minute walk away which serves good food and is also dog friendly. All in all I can safely say I will be returning to visit with my family again very soon. Camping with 6 children is never easy, but we loved every minute we spent at jubilee camping. It was the first weekend they were open and we had an amazing time!! The facilities were lovely, and even with the generator being struck by lightning, they tried everything to sort it out. We gave feedback and it was taken on board! The pitches were a great size, and the site very safe. This meant we could let the children go off and play, and meet new friends!! Thanks for a great weekend, I’m just trying to find some dates to book a return trip!!! 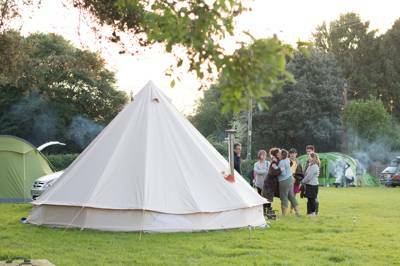 80 tent pitches and 7 bell tents in a 4-acre field, plus 2 group 'woodland clearing' pitches. 7 Showers and 7 toilets. All facilities are unisex, and unfortunately not suitable for wheelchair access. 2 washing-up sinks and draining boards are available next to the shower block. There are no laundry facilities, and there is no electricity on site. Campfires are permitted in fire pits and BBQs must be raised off the grass (bring your own or available to hire; logs for sale). 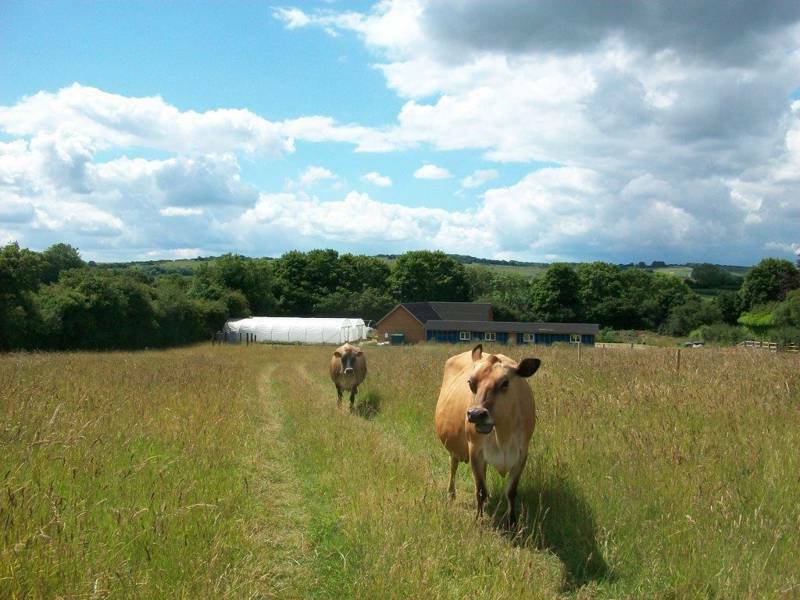 Plenty of natural wildlife, plus cows and a Shetland pony stud farm opposite the campsite which can be seen from the field (but not approached, please). Cycling is the best way of experiencing the surrounding countryside; be it the New Forest or Cranborne Chase – both are within easy pedaling distance. You could even cycle to the Sixpenny micro-brewery in Cranborne (01725 762006), and enjoy one of their award-winning real ales in the Tap Room. Cranborne Village (3 miles) is the hub of the Cranborne Estate and well worth a visit. Teeming with history, the village boasts the beautiful Manor House, built in the 12th Century as a hunting lodge for King John. As it’s a private residence for Viscount Cranborne (the eldest Son of the 7th Marquess of Salisbury), the Manor House isn’t open to the public, however the beautiful Manor Gardens are open one day a week during the Summer (opening times, and other information can be found here). There's a couple of World Heritage sites within easy reach: The Jurassic Coast is around an hour away by road, and Stonehenge is 40 minutes. It’s around 20 minutes to Salisbury and 30 minutes to Bournemouth, so, where you want to go shopping, head to the beach, or catch a theatre production, you’re well catered for. Go for lunch at Cranborne Garden Centre (01725 517248) or The Compasses Inn (01725 518231) is only a few minutes walk from the campsite. If you want an alternative to The Compasses Inn for dinner, La Fosse (01725 517604) can also be found in Cranborne; an intimate fine dining restaurant run by Dorset Chef of the Year Mark Hartstone and his Wife Emmanuelle. Also, there’s the Inn at Cranborne with all ingredients found within a 30-mile radius, including game, seafood, and smoked meats. There is a village shop stocking that's heavy on the most local products, including real ales, artisan breads and handmade cheeses. A local mobile pizza van and fish and chip van will temporarily be available on site at certain times (a schedule for both will be given to campers on arrival). 28 days a year: The 2nd Bank Holiday in May, the 3rd weekend in June, plus most of August. On the High Street in Fordingbridge, drive through the town to a small roundabout with The Augustus John Pub on your right hand side. Take the second exit (straight on) towards Sandleheath and Damerham. Continue on this road for 3 miles, which will go through the villages of Sandleheath and eventually Damerham. Once in Damerham (mind a couple of sharp bends), the road will take you past The Compasses Inn on your left. Continue, still on the main road, through to the other side of the village, round a sharp right-hand bend and away from any houses. The entrance to Jubilee Camping can be found on the left, approximately 200 metres from the bend. The most local train station is at Salisbury (12 miles). Buses from Salisbury to Fordingbridge are fairly regular; it’s the last 3 miles which may prove a problem as there is just one bus service a day between Fordingbridge and Damerham (timed for the school run, i.e. weekdays only). If necessary, and by prior arrangement only, the campsite owners may be able to collect/drop off campers to/from Fordingbridge bus stop, however this may not always be possible and may incur a small charge. 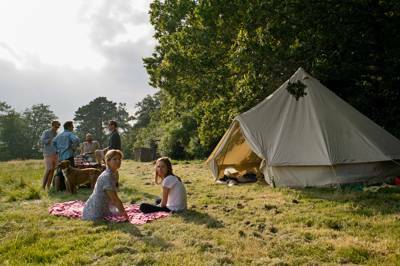 A quiet, spacious adults-only campsite on the edge of the New Forest National Park, Hampshire.